Rep. Ilhan Omar (D-MN) hit back Wednesday at President Donald Trump’s call Tuesday for her to resign from Congress or quit the House Foreign Affairs Committee over her antisemitic rhetoric. But an article in a local Minneapolis/St. 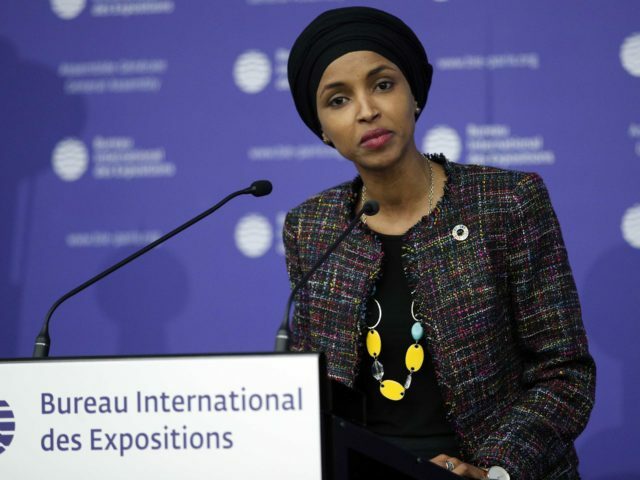 Paul newspaper reported Tuesday that Jewish leaders in Minnesota had spoken to Omar about her views last year – and that she failed to learn anything. Last year, before she was elected to the House of Representatives, before she emerged from a crowded Democratic field in Minnesota’s liberal 5th Congressional District, leaders of Minneapolis’ Jewish community fashioned what could be described as an anti-Semitic intervention of Omar, a rising star of the left whose remarks had made many fellow Democrats in the Jewish community uncomfortable. Last year, state Sen. Ron Latz, a St. Louis Park Democrat who has served in the Legislature since 2002, invited Omar to his house, where a number of Jewish leaders had gathered. It wasn’t an ambush; Omar knew that group was there, and their purpose was to enlighten her. [Latz recalled:] “Over the course of about two hours, we shared with her our concerns for things, including language that has references and meanings beyond just the meanings of words. Tropes, dog whistles – call them what you will. We explained to her how hurtful, and factually inaccurate, they were.